Sitting beachfront, Aquazure offers all of the necessities for an ideal Caribbean experience. It has a clean modern look and proximity to not only the beach, but to local shops and restaurants as well. After a quiet walk on the beach, enjoy the peaceful trade winds on the terrace or by one of the two freshwater swimming pools. The guest house also adds privacy if you’re bringing another family or a large group. Privacy and luxury right on the beach! Beachfront Villa Aquazure features three bedrooms, a one-bedroom detached guest cottage, and the powder-white sands of Leeward Beach. The area is relatively secluded and private with gorgeous water views. Wake up and walk a dozen steps from the pool deck into the ocean. The water is calm, shallow, and great for kids. Most boat captains and excursion guides can pick guests up right in front of the villa or at the nearby Blue Haven Marina. Walk for miles along the white sandy beach looking for seashells, skipping through the waves, or watching the sunset. Kayak through the mangroves and across the channel to Iguana Island, or relax in the pool. The pool is perfectly sized for small parties, and a nearby veranda shades al fresco living and dining. There’s nothing better than having a sundowner as the sun sets. The air-conditioned interior enjoys a comfortable and spacious Great Room which includes the living and dining rooms, as well as a fully-equipped kitchen. Off the Great Room are three bedrooms, each with king beds, private terraces, and ensuite bathrooms with both indoor and outdoor showers. Each bathroom has a large wall mirror, hairdryer, and large closets with wooden coat hangers. The master terrace opens to the freshwater pool and beach. Each bedroom enjoys a cable TV and air-conditioning. The optional 1-bedroom guest cottage comes with a private freshwater pool, terrace with a barbecue, a small kitchen, living area, and king bed. It’s perfect for grandparents, a couple with a young child, or a nanny. Beachfront Villa Aquazure’s location is great, near shops, restaurants, golfing, and Grace Bay. The villa is private but still convenient, and the Leeward Canal has tons of maritime excursions. You are provided the first $200 per week in the main house and $100 per week in the guest cottage of electric cost at no charge. Any A/C overage will be an additional fee. Car rental, private chef, butler, server, grocery and beverage shopping (pre-arrival and during your stay), liquor and wine delivery, nanny service, baby equipment, spa services, yoga and personal training, photography, and private airport transfer/car service can be arranged for an additional fee. The villa was amazing. From the kitchen to the beachfront patio, it was all that we imagined. Our service from WhereToStay was excellent. We had 4 couples in Aquazure, and it was perfect! We loved the location and enjoyed watching the turtles from the outdoor living area. Great walks on the beach made wonderful memories with friends. Andrew was great to work with, he made our trip easy to book and had wonderful suggestions. Priscilla was our property manager and was great too. Our daily housekeeper kept the place in order, so everything was perfect! The villa was well appointed and comfortable. The area is relatively secluded and private, with tremendous water views and access. There is a good deal of nearby construction, but noise was at a minimum and not intrusive. Overall, we had a very pleasant vacation experience, which was even more impressive since we arrived just after the hurricanes. Working with WhereToStay.com was a very good experience. This was our second time staying at the villa - what a gem! We loved watching the sunrise in the morning and then taking a short walk to the peninsula on what feels like your own private beach. I’ll miss having sun downers while watching the sunset. The new owners have made some nice changes, like adding daily cleaning service. The location is great - shops, restaurants, golfing, Grace Bay, etc. are all just minutes away. 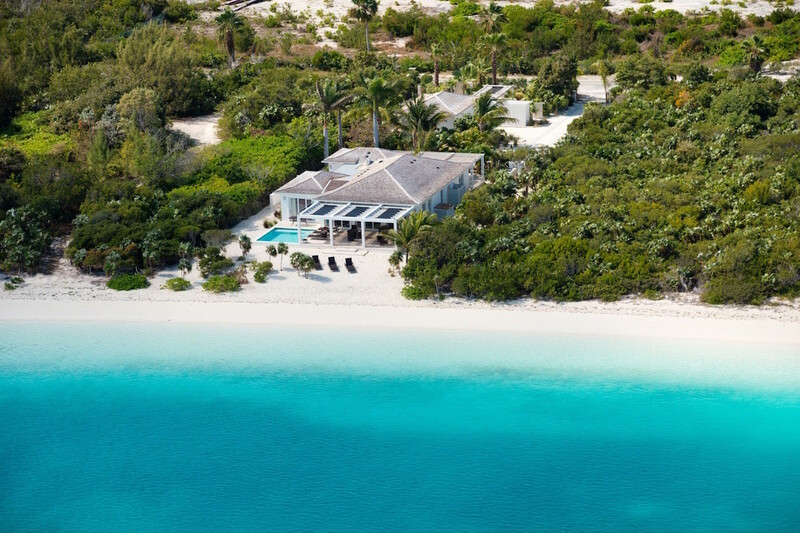 Wake up and walk exactly 14 steps from the rear patio into the ocean, kayak through the mangroves and across the channel to Iguana Island, or simply relax on the beach or in the pool. We will be back - Aquazure feels like our home away from home! Had the vacation of a lifetime! Literally a few steps from the ocean, this villa is truly amazing. It’s modern in design and amenities, even includes a guest house. We had 7 people in the villa, and had plenty of room. These pictures do not do it justice. Service was top-shelf. Daniel , our concierge, was attentive to our every need. The cleaning staff came in daily to put the villa in order. I would recommend this villa and this service to anyone. We plan to return to Turks and Caicos next year! Highly recommend working with Andrew. It was our first time renting a private villa, so we had some trepidation prior to arrival. Andrew answered all our questions, and everything upon arrival matched Andrew’s responses. Well appointed and well maintained Villa. The two kayaks were a nice surprise: paddle over to Iguana Island. The photos of the villa are accurate, if not understating this home. Plenty of room for four couples. Shawna was Fantastic. Y’all kept us well informed and were very patient with us and our questions about our villa choices. You were very knowledgeable about the Turks and Caicos. Blue Orchid gives you the best of both worlds - enjoy the sunrise in the morning then walk a little way up the beach and enjoy a beautiful sunset. Awesome home, with ample space, great location - great memories!